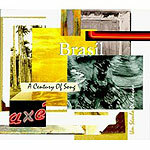 CD review: "Brasil: A Century of Song"
This review first appeared in the October 27, 1995 issue of the North County Blade-Citizen (now North County Times). This new box set traces the history of modern Brazilian music, from its folk origins through the present. The four discs are arranged by style: Carnaval, bossa nova, folk and traditional, and contemporary pop. The folk and traditional disc traces the roots of Brazilian music, with recordings from the 1930s and '40s, plus contemporary traditional musicians who are preserving their culture's heritage. The bossa nova set includes, of course, Antonio Carlos Jobim; the contemporary pop set Milton Nascimento and Gal Costa (but where's Djavan? ); the folk/traditional disc, Carmen Miranda. The accompanying booklet provides both incredible photography and in-depth background on the artists and their music. The recording quality is top-notch; the music itself listenable and enticing.